Using the sides of the glass candle holder as a guide carefully mark out the desired length onto the sticks with the pencil. Carefully cut the sticks to the required size. You can either cut the sticks so that they are level with the top edge of the glass candle holder, or cut them in a range of varying lengths for a more rustic finish. Working with one stick at a time, draw a thin line of glue using the glue gun from the top of the jar to the base. Position and press in place the first stick, ensuring that the ends of the sticks are flush to the base of the glass candle holder. Allow the glue to cool for a few moments before adding a second line of glue parallel to the first and securing the second stick. 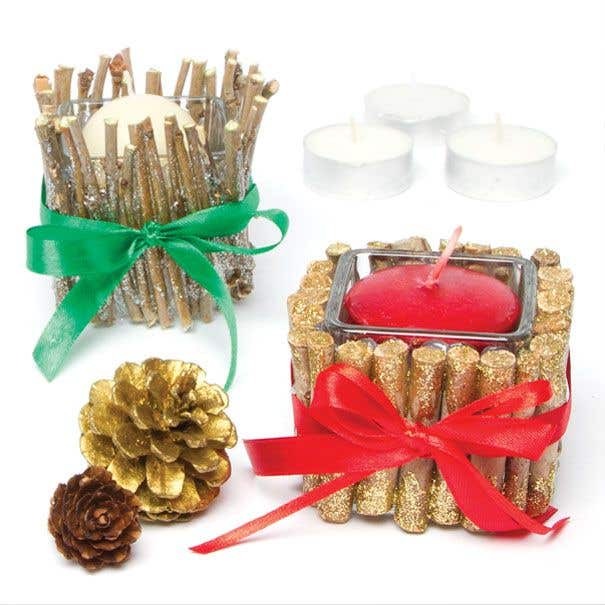 Continue working around the outer edge until the entire glass candle holder is covered. Set aside to cool fully and bond the sticks to the surface of the glass. Once the glue has fully dried and the sticks are secure, select a Pictixx Glitter Pen to apply accents of glitter. Position the jar onto one side and work each side in turn, allowing the glitter to fully dry before moving on to the next side. 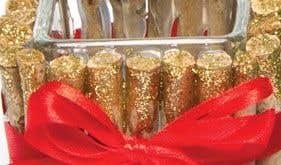 Apply the glitter either to the tops and bottoms of the sticks, or in a band around the centre, working in sweeping strokes to give a generous sprinkling of glitter. 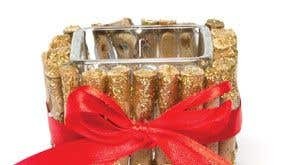 Once the glitter has been applied to all sides of the candle holder, cut a 25cm length of ribbon and position a glue dot in the centre. Press this dot firmly onto the centre back of the candle holder to hold the ribbon in place. Draw the ribbon around the centre of the candle holder and secure with a neat bow at the front. 'Try layering up two different styles of ribbon to create a layered bow. Add a tea light candle into the candle holder to complete the project. 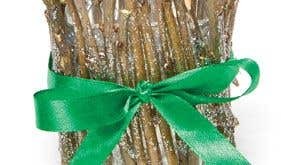 Remember, never leave a burning candle unattended and, if you have sticks extending over the top of the jar, be sure that they do not come into contact with the flame.